The bunk system is easy to set up to most any hull. Torsion axles and disc brakes are standard on all models except those 92″ wide with leaf spring suspension. With a wide array of available options, our 5 STARR trailers provide the Load Rite durability and performance you’re looking for at an exceptional value. All of these features are backed by the industry leading Load Rite / 5 STARR 2 + 3 Warranty. Patented designs offer many features that add functionality to a great look. Integrated wire gutter beneath the top flange securely protects wiring and brakelines. Models to 7,300 lbs. capacity feature a captured fastener channel along the bottom flange offering invisible mounting points for other features. Web mounted crossbars strengthen the overall frame assembly. Marine-grade carpeting over wood slab bunks provide solid support without marring the hull during loading and unloading. Initial setup is simplified by this basic design. 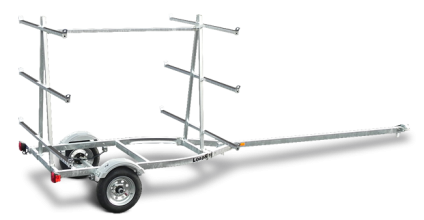 Tongue jacks are standard equipment on all Load Rite Elite models 90″ wide and wider except two-place PWC models, all 5 STARR models, and all UT, EQ, and CH models. Appearance and specifications vary by application. Tongue jacks are optional on all other models. Standard equipment on all triaxle models. 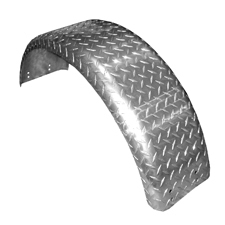 Stylish one-piece aluminum diamond-plate fender design is featured on all tandem and triaxle boat trailers. The keel pad offers some protection should the boat keel come in contact with a crossbar. Smoother riding and longer wear life than many bias-ply tires. A highly recommended upgrade. Available for 13″ and larger wheels. 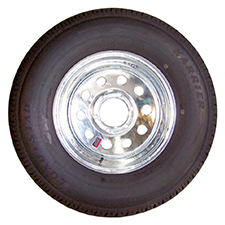 Brake laws vary by state and require dealers to sell trailers that comply with the brake laws of the state where the trailer will be registered. This is a very important safety issue. For full information contact the appropriate state Motor Vehicle Department. As always, Load Rite recommends brakes on all axles where available. These multi-purpose covers provide a smooth surface to help the boat or pontoon to slide easier when launching and loading. They also offer an insulating barrier to help prevent corrosion for metallic hulled craft. Protect your aluminum hull. Highly recommended for metal-hulled boats and pontoon applications. Carpeted bunks located just aft of the tongue area but ahead of main bunks. Positioned low in the frame to “catch” the keel as the boat is loaded and prevent keel to crossbar contact while launching. Target bunks are optional on all single axle Load Rite Elite LR-AB, some galvanized models, and all 5 STARR 5S-AC bunk models. Some applications may require an additional crossbar be installed. Available for most Load Rite Elite LR-AB, LR-ASKI, LR-AR, LR-AS and 5 STARR 5S-AC aluminum models. Includes main frame hardware. Excludes bunk, roller, winchstand, and coupler / actuator hardware. Not available for galvanized frame models. PVC side guides provide additional guidance when lining up to load on steep ramps. Optional on most other boat trailers including all 5 STARR models. Adjustable, galvanized steel, Independent Bow Stop Assembly. Telescopic post, 2×6″ wooden carpeted wedge pivots to adapt to bow angle. Mounts to the tongue. Useful as a forward stop for boats with a high bow, bow pulpit or windlass that could interfere with normal winchstand operation. Shown with aluminum wheels, target bunks, footed tongue jack, and LED light options. Brig Eagle 580 on aluminum I-Beam 5S-AC23T5200102LTB1. Cobalt 232 on a 5 STARR 5S-AC24T6000102TB1 (shown with optional Star Mag aluminum wheels).